Whats the best repair manuel for a 1967 omc electricshift ? Got the upper and lower apart and the upper and water pump look great. Lower had milky oil in it, so it needs seals in it. Put the new bearings seals and retainer plate in today, took the transom seal off to put the new one on tomorrow. Waiting on lower end gasket kit to get here and water pump shaft. My new SS 14x15 prop got here today too. Due to health reasons I am being forced to sell my Inca project. The hull is in good shape, with no rot. the stringers are in excellent condition. The interior needs cushions and the deck needs 4 pedestal chairs. It also needs to have an engine cover made for it. The control station was messed up due to exposure, and a new one has been fabricated, steering is attached, but needs drilled and wired for gauges. Transom is in middle of conversion from early Volvo to OMC, and will need finished. Just testing the waters with this note. I have owned a 270 Express for about 15 years and it is time to move on to a pontoon. The boat is in average condition, maybe good for its age. Has single 260 Mercruiser with 1300 hours. Good runner, full tune up at beginning of last season. Full camper top with windows and screens. This has been a great boat for us. It has its needs due to age and my inability to keep it up like I used to. I am going to donate for tax write off unless someone here has an interest in it. If any interest, I can email pics and more details. Located in north central IL. If I can get around $4K, its gone. I'll watch site for any replies. I just bought a 24' (ish) 1972 Imp Inca cuddy cabin and was hoping that someone here might be able to help me with more information about this boat? It has twin Mercruiser inline 6's (Chevy 250/Merc 165 I believe) and dual Mercruiser outdrives. Among other things, Id like to get my hands on the owners manual. 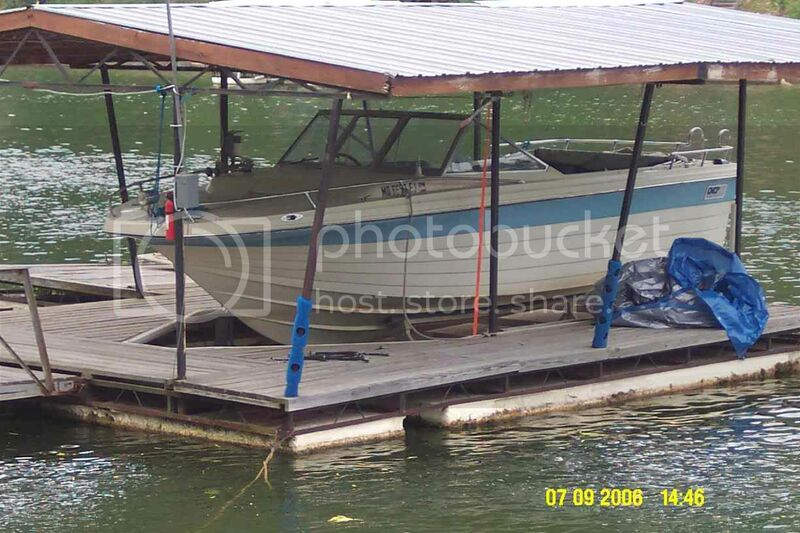 Also, the boat doesnt have any sort of deck roof/covering. What was supposed to go on these from the factory, and how would I go about getting it replaced? Are there any common issues I should look out for? So far, the engines fired up nicely with fresh plugs and fresh gas and the propellers spin when engaged. Most of the gauges dont seem to work anymore, are there more current offerings (maybe a digital dash) that are compatible with the old GM sensors? Well I got the lower all rebuilt and back hanging on the boat, Waiting on it to stop raining to fill it with lube and try it out. If anyone is parting out their Inca, Im looking for the cuddy cabin door. Those Incas came with either a hard top or open to the sky with a canvas half-cover Bimini. Yours looks to be the one without the hardtop. You can get full cover Bimini from a few places here in Phoenix for about a grand, perhaps a bit more, and a bit less for the half cover. Includes plastic side curtains. Check Craigslist for a cuddy door. Otherwise, I don't know about that. If you have the OMC outdrive you can download a manual online or find one for sale that way. You won't have any luck finding an owners manual, I don't think. As for your dash, might be a loose or disconnected wire or a blown fuse. Digital dash, again I have no idea. Most likely you can make what you have work and that's retro and beautiful. Good luck. Arizona Awning in Phoenix is a great place for Bimini covers. I've used them a lot over the years. The only issues I would be especially looking at for your boat now is dry or wet rot from exposure if the boat has been sitting for an extended time in the open without cover. I believe MerCruisers use hydraulics for tilt and I'm an OMC guy so I have no comment about that. If you go back to the very beginning pages of this forum you will find a lot of useful information about IMPs posted in those days. Not so much, lately. I recently gave my '75 IMP Aztec to my son who is getting it lake ready, but slowly. Mostly outdrive problems. Check your motor mounts for dry rot around the bolts. Check your gas tanks for water around them. I'm out of suggestions. Again, good luck. I love it when I see an older IMP cruising the waters. Dudley, you could have a gem. This was once considered the Cadillac of boats and there was no finer boat in its class for comfort and reliability. If the boat has been stored inside and not out in the weather that's good. If outside and not covered, that's not so good. The areas to check, or have a professional check, would be for wood rot, the motor mounts, the gas tank, and the motor itself. Check the hull for damage, etc. The good news is that if you have a serviceable boat a little bit of money might get it afloat and you can have a lot of fun with it. The bad news is that this boat is never going to get you a lot of money on resale and you most likely cannot get insurance on it. So, be careful how much you spend. Without seeing a photo it's hard to advise you. Good luck. If you decide to part it out, this forum might be a good place to advertise your parts.